Ingredients: Chicken broth, chicken, liver, wheat gluten, meat by-products, carrot, wheat flour, egg whites, modified corn starch, spinach, soybean flour, salt, potassium chloride, zinc sulfate, ferrous sulfate, copper sulfate, manganese sulfate, potassium iodide, sodium selenite, tricalcium phosphate, choline chloride, vitamin E supplement, niacin, thiamine mononitrate, calcium pantothenate, pyridoxine hydrochloride, vitamin B12 supplement, riboflavin supplement, vitamin A supplement, folic acid, vitamin D3 supplement, biotin. 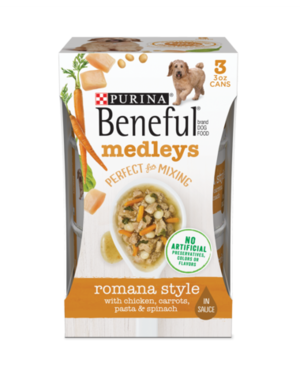 Beneful Medleys Romana Style With Chicken, Carrots, Pasta & Spinach is formulated to meet the nutritional levels established by the AAFCO Dog Food Nutrient Profiles for the maintenance of adult dogs. We'll begin this review of Beneful Medleys Romana Style With Chicken, Carrots, Pasta & Spinach with a detailed discussion of the ingredients. The first ingredient is chicken broth. Chicken broth provides both flavor and moisture; however, as with other broths, chicken broth does not provide any notable nutritional contribution. The third ingredient is liver. Liver is a controversial ingredient because the source animal is not specified. Anonymous animal ingredients are typically very low quality and may contain almost any animal, including dogs and cats! Because ingredients are listed in order of pre-cooked weight, the remaining ingredients in Beneful Medleys Romana Style With Chicken, Carrots, Pasta & Spinach are not as important as the first five ingredients. The next ingredient is wheat flour. Wheat flour is produced by grinding uncooked wheat into a powder. In addition to dietary fiber, wheat flour provides various vitamins, minerals, and plant based protein. Wheat is considered a controversial ingredient because of it's protein content. Plant based proteins degrade the overall protein quality in the product. In addition, many people believe wheat is one of the most common ingredients to cause food allergies or intolerance. However, grains such as wheat are typically low offenders in comparison to certain protein sources such as beef. Then we have egg whites. Egg whites consist of shell-free egg whites, which are easy to digest and contain high quality protein. Egg protein is often given the highest biological value (BV). The BV metric measures the usability of the ingredient's protein. potassium chloride is the next ingredient in this recipe. Potassium chloride is a potassium supplement. The official PawDiet rating for Beneful Medleys Romana Style With Chicken, Carrots, Pasta & Spinach is 3.5 out of 5.